I used to love going to the Natural History Museum. I liked to draw animals and I would look at the skeletons for inspiration. I noticed that horses (my favorite) had knee joints like I do, only very high up, and the lower legs bent backwards, like my ankles, but much higher up. The ball of my foot corresponded to a horse’s hock and my toe to its hoof. 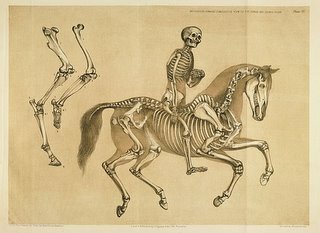 Thinking about how a horse skeleton was like my own helped me to draw good pictures of horses. This exquisite illustration by Benjamin Waterhouse Hawkins captures what my childhood eyes saw intuitively. When I consider the human form nowadays, I often find it useful to remember that much earlier on our evolutionary tree there were quadrupeds on land and fish in the sea. We retain shadows of those early ancestors in our anatomy and physiology. Our current design was modified from older forms in order to adapt to our organisms needs. Yet the original patterns were incorporated and not thrown out. This fact is also visible when looking at developmental movement in children. (Raymond Dart developed an experiential system for exploring developmental movement patterns. His discoveries are worth looking into). The way we coordinate ourselves is intimately tied to our ancient, non-human ancestors. It is valuable to look at how a horse or lizard or fish moves, when I want to consider how I move. My form, my activity, my life reflects uncounted lives before me. I am a living natural history museum. This entry was posted in Uncategorized on August 31, 2014 by HOLLY DOBBS.